Road near Samaria town where terrorist slaughtered three members of Salomon family reopened to PA vehicles. 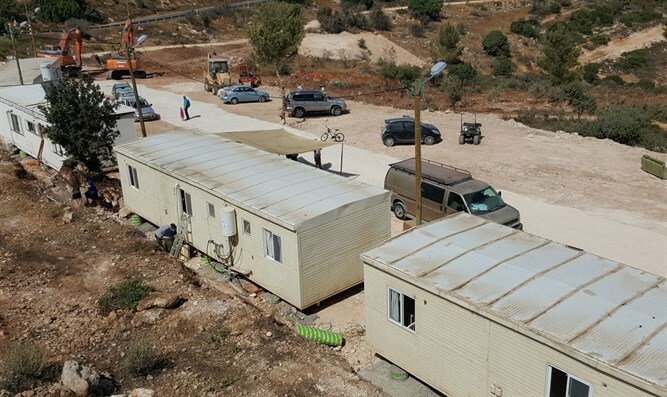 The IDF has reopened a segment of Route 450 in southwestern Samaria which had been closed to Palestinian Authority traffic following the slaughter of three Jews in the nearby town of Halamish (Neve Tzuf) in July. On Friday, July 21st, 19-year-old terrorist Omer al-Abed drove to Halamish via Route 450, snuck into the town, and broke into the Salomon family home. The Salomons, who were celebrating the birth of their grandson, was hosting a family gathering that Shabbat. The terrorist burst into the home and stabbed four members of the Salomon family, killing three of them, including Yosef Salomon, 70, Haya, 46, and Elad, 36. Following the massacre the army closed a stretch of Route 450 which passed by Halamish to PA traffic, barring all vehicles bearing PA license plates. According to a report Tuesday morning by Yisrael Hayom, the IDF has opened up the segment of the 450 to PA traffic which had been closed since the July attack. The change comes following the positioning of hi-tech sensors and other anti-terror equipment along the perimeter of Halamish. Residents of a new neighborhood in Halamish established near Route 450 after the attack say they’re concerned by the reopening of the road to PA traffic. An IDF spokesperson said the army had spent months working to secure the area with hi-tech sensor equipment. “Over the past few months, the [army] has undertaken a number of projects to secure the town of Halamish, including the placement of hi-tech equipment and security components that will help protect residents. Tunisian man identified as key suspect in Berlin terror attack ID of Tunisian man found in truck used in attack on Berlin market that left 12 dead, dozens injured.